Fisker will launch the final production version of its Karma plug-in hybrid at this month's Paris motor show. The American company will also announce details about the expansion of its dealer network and future marketing campaign. The Karma is powered by a front mounted 2.0-litre turbocharged petrol engine and two 150 Kw motors which combine to provide 397 Bhp. 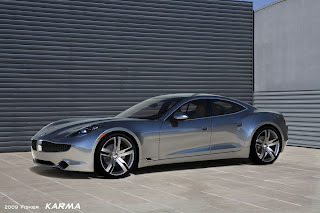 Fisker claims it will do 0-62mph in 5.9 seconds and go on to a top speed of 125 mph. The car is set to achieve an annual average economy of 100mpg and CO2 emissions of 83g/km. It will travel 50 miles on electric power alone, but has a 620-mile range when used in range extender mode. The company’s dealer network is being established to support Fisker’s goal of producing more than 100,000 cars per year. His experience and undeniable talent, makes of Henrik Fisker the more appropriated name to present to the world, this special and consistent solution in an impeccable design. Congratulations to Bernhard Koehler too, and all Karma Couchbuild team.